Made by LAPIN PRODUCTS, INC. 164 Delancy Street Newark, New Jersey. A plastics manufacture, Lapin made many products such as molded plastic goggles, as well as ladies safty razors in the 30's. They are credited with making the first molded plastic toy cars, just before the second world war. The Happy tune Ukulele was advertised in Life magazine as the "New, all plastic Happy Tune Ukulele" in the Nov 27th 1950 issue. 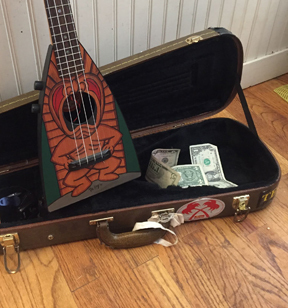 Lapin Products also made other toy instruments, such as "The Fonz" guitar in the 70's, the Vinne Barbarino (welcome back kotter) and Elvis guitars in the 80's.